Do You Have What it Takes to Take Back Control and Save Humanity? The Hackers Guild is a one versus many, action selection board game for 3-5 players ages 14 and up that plays in about 150 minutes. Set in the year 2120, humanity is faced with a new challenge: Monolith Global inc is trying to enslave mankind by having the new world wide government be run by their robots. Opposing the hackers will be the final player who will take on the role of Network Administrator for Monolith Global. His objective is simple: prevent the hackers from completing their mission by any means necessary: changing game rules, increasing site security, turning the hackers against each other, or even the incarceration of the hackers. Your mission is clear but time is running out for the guild. Will your team of hackers be able to accomplish the impossible and save humanity from slavery? 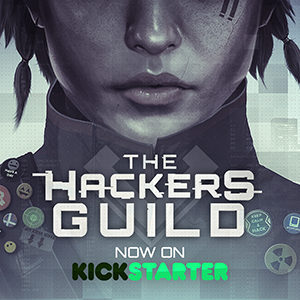 Designed by Raymond Northcott, The Hackers Guild is now on Kickstarter and the campaign will run until the 4th of November.